British billionaire Sir Richard Branson and his two children set out with a crew of champion sailors early Wednesday on a 99-foot ulta-modern racing yacht in an attempt to break a trans-Atlantic speed record. The sailors faced nasty weather on their 3,000-mile race through the North Atlantic, where the crew may need to dodge icebergs, and will almost surely be drenched by the roiling, icy waves of the ocean pummeling the yacht. They hoped to break the record for a trans-Atlantic crossing in a single-hulled sailboat by making it to southwest England in less than six days. They launched from Battery Park City off lower Manhattan shortly after 2 a.m. to avoid a massive storm developing off New York, Branson said. "We know we're going to go through ferocious weather, and that's what we need to get the speeds we need to cross the Atlantic," said the 58-year-old chairman of the Virgin Group. "But obviously we don't want the kind of storm that's going to break up the boat." The race began at about 5:30 a.m. at Ambrose Light in New York Bay, said Alex Tai, of Virgin Money, which is sponsoring the effort. The sailors are aiming to reach Lizard Point off the coast of England in less than six days, 17 hours, 52 minutes and 39 seconds -- the current record. Joining Branson and a crew comprised of members of Britain's America's Cup sailing team and several medal-winning Olympians were his son, Sam, 23, and daughter, Holly, 26. Sam Branson said he wasn't worried about the risk of navigating the Atlantic in the foul weather. "I think it's more going to be just very unpleasant," he said. "The chance of anything going real wrong is not real high. We're in a great boat with a world class team." Holly Branson, an amateur sailor and physician who will serve as the team's medic, said she was prepared for the freezing weather. "I've got pretty much all my clothes on now. Many layers. A couple extra thermals in case we need them," she said. 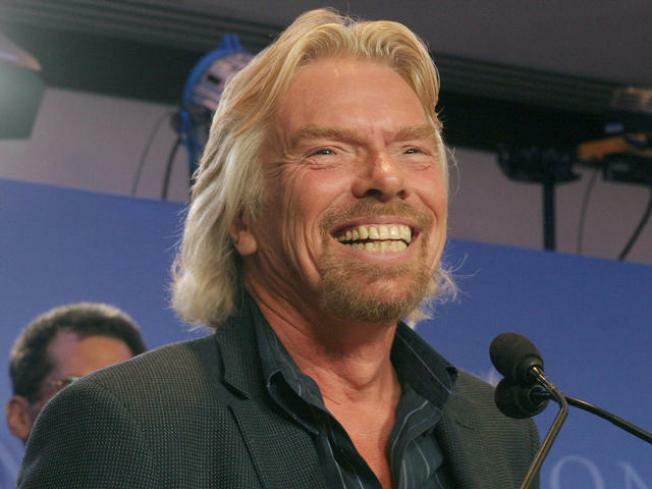 Richard Branson has been breaking speed records since the 1980s. He broke a record in 1986 that had stood for 34 years when he manned a speedboat across the Atlantic. He has also piloted hot air balloons across the Atlantic and Pacific. He has been on an adventuring hiatus since the 1990s, but said in September when he announced this latest undertaking that he couldn't resist the chance at "the greatest sailing record of all."